This image came across my newsfeed from Eat Breathe Thrive on Facebook earlier this week. Looking through photos from the last few years, I recalled my thoughts about myself at the time. I have a series of photos from 2010 that I distinctly remember being critical of because of the way my stomach skin rolled at the top of my jeans. When I look at those same photos today, I remember how hungry I felt. I remember feeling faint if I missed “meal time” by 30 minutes. I see myself as thin and notice muscles in my arms that I overlooked when I saw those images for the first time a few years ago. Conversely, I look at photos from 2009 (before I lost weight) where I remember feeling “skinny” but was considerably more full than I am at this moment. I am reminded that my perception of my body has very little to do with my body and much to do with my mind. In a recent healing session with Ricky Yutuc, I asked to be free of judging my value by how I think society views my physical form. He helped me forgive myself for ever thinking there was something innately defective about me and appreciate I chose the body I have. He gave me tools to forgive others for thinking there’s something innately defective about me or themselves. I have viewed myself differently ever since. Ricky has an exercise where he has you put your fingers to your throat while you say “I love myself” with conviction. After you say it like you mean it, you move your hand to your heart and say the same thing. I have done that exercise many times since. I am amazed at the difference it makes in my world view. I have a new relationship with my physical form. In my yoga practice, it lets me know how my life is going. It knows when something needs attention before my mind does. It knows when I’m getting sick before I feel symptoms. It is the house where my spirit lives. I am grateful for its strength and connection to the universe. I realized that my cravings for unhealthy things were really ways to manipulate my body into giving me the sensations I felt when I took in those things. That isn’t a way to treat a friend! Friends don’t manipulate friends. Friends don’t tell each other they are failures if they don’t do a certain thing. Friends support each other, listen to each other, take time for one another. Friends do good deeds for each other and apologize when they’ve made a mistake. Friends forgive. 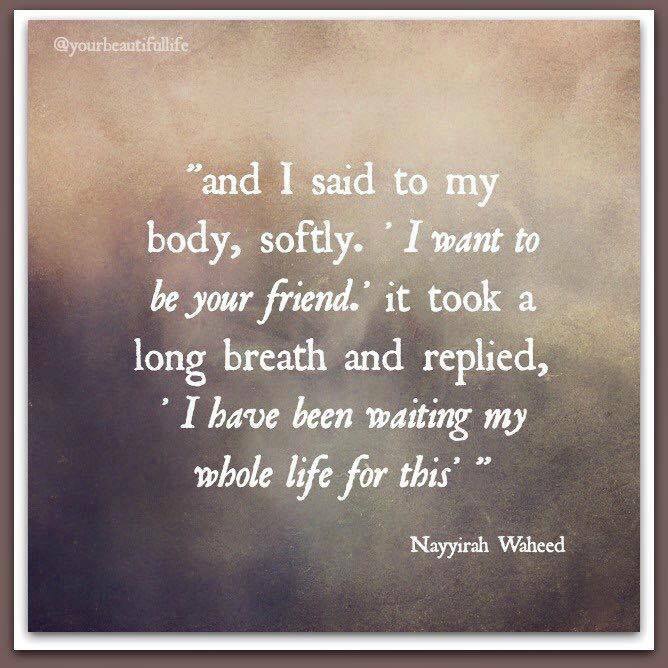 My body is my friend. I ask it what it needs and I go find it. My body has always taken care of me but I have not always done a good job taking care of it. I have been forgiven. For that, I am grateful.